How important is the cleaning service to you? Are you looking to get a cleaner. We can conduct a clean regularly or just occasionally? Once we start a service, a schedule of service can be drawn up. Getting a clean when your not at the premises. We conduct many of our services when the property is empty and a window clean rarely needs a person to be at home. We inform you of the clean. We have cards we can leave. We try to get payments made via Bacs as a swift way to collect. This is efficient and helps us keep prices competitive. 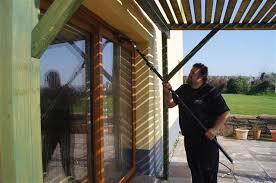 Do you require a window cleaner, gutter clean or pressure washing service? We can arrange the service you require. regular clean or occasional. It is either up to you or we can advise on frequency. Routine cleans are better for us to keep your property in good running order. A lack of maintenance can lower the value of the property, cause damage especially when gutters are blocked! We often see problems caused by leaving guttering blocked for long periods of time, these can often be avoided by periodic maintenance alleviates the problems and allows water to drain away from the property. We clean gutters all year through. Can I get my K-Rend cleaned? Yes we can clean K-Rend and other rendered surfaces. 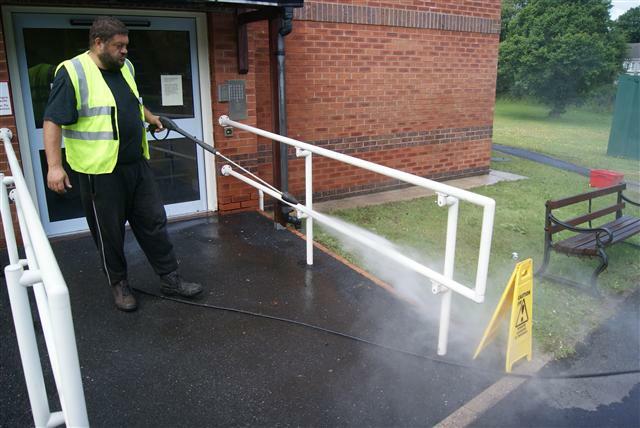 We can apply chemicals to clean many types or render. The term softwashing has been known in recent years or this process. basically meaning application of correct chemicals and using a low pressure to remove the dirt, mould, algae and living cultures. We do suggest this is done in dry conditions and when temperatures are above 5 degrees Celsius.